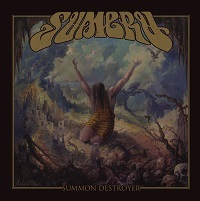 SUMERU is an Australian band out of Sydney that pretty much corners the market on Metal genres. Aptly, and effectively melding Heavy Metal, Doom, Stoner, Sludge, Black, Groove, and even elements of Thrash into their crushing sound. The band takes its name from Meru Peak, which is in the Garwhal Himalayas in the Uttarakhand region of India. ‘Su’ means good and ‘meru’ is mountain in Sanskrit. Ancient Hindu lore would tell that Mount Sumeru is a huge sacred mountain in the center of our universe that supports both heaven and hell, and that many of the supreme gods reside upon its peak. Yeah, I love history and mythology. So, the question remains can this five piece band live up to this lofty use of a name? Absolutely. The intro “Inanis Kultus” builds with an eerie oppressiveness that really serves to reinforce the band’s name. It’s as if one has just reached the peak of the mountain, discovered its secrets and regrettably awakened the old gods. The intro segues into track two, “The Temple”. A slow groove permeates and gives our first introduction to vocalist Matt Power. Here’s where the Death Metal influence seems to come in. Using a throaty, growl vocal, Power creates quite the distressing feel, as the dual guitar assault of Peter Bursky and Chris Wilson lay out a rumble of groove driven riffs, lifted by a surprising melodic solo. This formula continues into the title track, “Summon Destroyer” which additionally utilizes some crafty tempo changes that take the song through a sonic journey of influences. From Thrash like guitar riffs, to the low thunder of the deep end laid out by Pat Taylor on bass and Andres Hyde on drums, this track touches on gold. Hyde in particular shines. While not ridiculously in your face, his fills and rolls fill the song with interest. “Summon The Cold” comes next, and continues the harsh, heavy fusion of genres that really stand SUMERU apart from its contemporaries. Again, I find myself surprised by the subtle usage of the guitars to create a more melodic feel, like sun breaking through an intimidating storm. Yet, as quickly as the song brightens, the grim, theme of darkness returns to close out the track. “Kala Ratri” serves as another ray of sun; an interlude of violin and acoustic guitar, that harkens the following track, “Durga! Durga!”. Retaining elements of the interlude, Thrash like riffs weave in and out, creating an avalanche of guitars heightened with Power’s vocals crushing like boulders of granite. Closing out the song the riffs get some ‘magic’ production tricks, that add a cool pulsating feel to them. “Rivers of Lethe” is a headbanger throughout. As the song with the fastest tempo, it most definitely came across as Thrash inspired to me. From the guitar solo to the thundering, steady drum pace, this one hits you like lightening on the mountain peak. We return to a slower pace with “A New Ritual”, one perhaps of reflection on all that’s transpired previously. The longest track, clocking in at just over nine minutes, it also showcases the band in a bit of a juxtapose. Power’s vocals are vastly tamer here initially, only to return to the previous venom as the song builds. The song serves as a perfect closer for what we’ve just experienced. “Summon Destroyer” is quite an interesting find. On my first listen, I found myself somewhat distracted and unable to process what I was experiencing properly. Thankfully, I spent a couple more listens digesting what the band crafted. What SUMERU have presented here is a clever, melding of sound that hits like a thunderclap. The fact that the album should appeal to fans of multiple genres is invigorating. I see it as fresh, and an innovative blend of Metal that definitely deserves a listen.